Blogging is fun, blogging is easy. Blogging is rewarding. Many of you might already have a Blogspot, Blogger, Typepad or WordPress blog accounts. But those are not revenue-generating blogs. A self-hosted (having your domain) blog, like mine, is what attracts advertisers. Search engines value self-hosted blogs more than other blogs for contents of similar quality. Creating a new self-hosted blog is easy, over the years I have created many blogs. Some I sold off for profit, some are still earning money. While I have been helping my readers create their own blogs for years, I think it’s a good time to write a comprehensive post. The blog is an excellent way to have side income. I earn $4,000 – $6,000 a month by blogging, by means of advertising and affiliate sales income. This is a step by step process to create your first blog. A self-hosted blog in its own domain is what generates revenue and advertiser’s interest. So, if you want to make money from your blog, create your own domain and start writing Spend just 20 minutes and about $20 to follow the steps below. You’ll be up and running with your own blog before even you know it. Special Offer – If you buy your hosting through Siteground, via above link, I will send you a list of 10 potential advertisers for your blog, with their email ids. After your purchase, fill out the below form and hit “send”. SB, I have purchased hosting service for my site from BlueHost, clicking through the link on this page. Please send me list of advertisers, as promised. I get many requests for this service, with no corresponding record of the purchase in my affiliate dashboard. 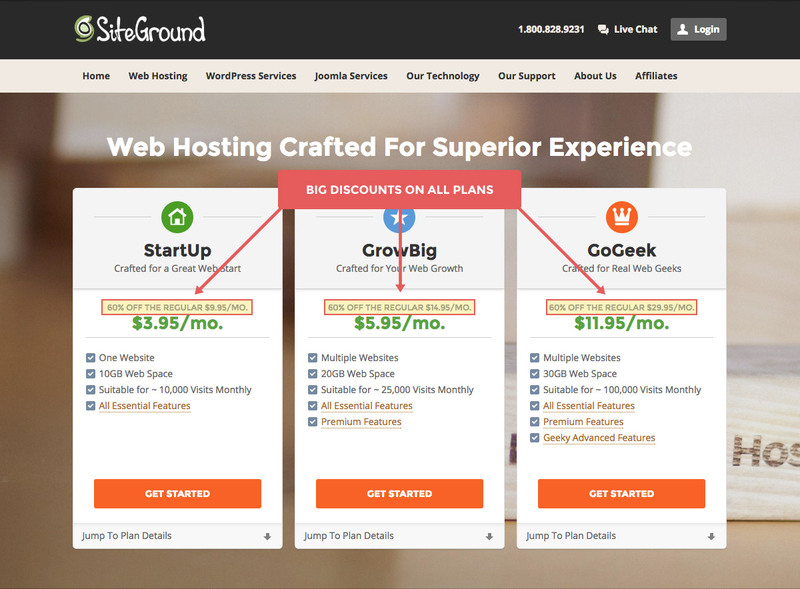 Please make sure you buy your hosting from any Siteground link on this page to get the benefit. Domain name is same as your blog name. The most fun and innovative part of the entire process is to find that perfect domain name. Give it a care like naming your first-born. You can create a domain in your name, you can create with a catchy phrase. Brainstorm ideas with others. My philosophy is step by step progress towards a goal, so One Cent at a Time name was fitting to this philosophy and the subject of finance. I was lucky that the domain was available when I registered it in 2011. Pick a name that relates to the theme of your blog. A name of a finance blog should be different than a food blog, theme wise. Avoid using special characters in the domain name. Try to go for dot com (.com) domain first, followed by .org People do remember sites most with these two extensions. Be original and do not try to imitate other established names. Do not aim for a spelling variation of popular blogs. You can try to get a short catchy name. A Google, Yahoo, Bing, Quora or a Hulu . They are all easy to remember names. One word is the best domain you can aim for. But, almost all dictionary words are taken up. You need to invest a word or combine two to form your domain. Try to avoid long names. I picked One Cent at a Time, as it was a catchphrase, which was easy to remember. I am a fan of SiteGround. I had a nightmare with other hosts before choosing Siteground. I was with Hostgator and Bluehost before. When I started blogging in 2011 I was using Hostgator, after exactly 2 years my blog started experiencing lots of problems. My monthly hosting fee skyrocketed and I started frequent downtime, sometimes lasting an entire day. Then I moved over to Bluehost, after 18 months or so, I started having the same experience, it was a deja vu! Every week my site was down for almost 2 months before I left. I even opted for a higher plan in between, but to no avail. Then I discovered the owning company for these hostings are same. No doubt their policies are same! I even messaged the CEO of Bluehost via Linkedin, one rep called me 2 days after and send me a big error log. He suggested a complete overhaul of the site code. but I was using WordPress, I didn’t write a single line of PHP code. so funny! Then one of my blogger colleagues suggested Siteground to me in 2015. Since then, this is the 4th year with Siteground and I can count on just two fingers how many time I had a site outage. I never had to call their call center, their chat reps are fast, kind and nice. I am extremely satisfied with Siteground now. Now, almost all blogs in our blogging community moved over to Siteground. I am glad we took this decision collectively. Hosting is a recurring cost, you’ll have to pay every month unless you pay upfront for a year or more. Siteground plan starts at $3.95 a month for basic option. You can pay monthly or you can pay up to 3 years upfront. As a starter, I suggest you get for one month initially. I now have a $14 per month business plan with them, but I’d suggest you start with the very basic and as your traffic increases, you can move to higher plans. You can certainly go with other hosts if you are not comfortable with Siteground. Honestly, I don’t have a pleasant experience with Bluehost, Godaddy or Hostgator. I found my site slow and going down frequently. Since I moved to Siteground since last 2 years, OCAAT performed better. Don’t get disheartened if your name has already been taken. Go for the next best option. I’d prefer only .com and .org domains for my blog and won’t be interested in other extensions these two are most common. But before registering a domain, you’ll have to pick a plan first. If you want to give blogging a shot to see if there’s a blogger in you, go for only a year of hosting @ $3.95 a month. When I started, I paid for a year of hosting. Now I pay for 36 months in advance, to get the bulk discount. If for some reason, you lose interest, you can cancel your hosting to get the money back on the pro-rata basis. So, the total out-of-pocket cost is under $20, to try blogging for a month! 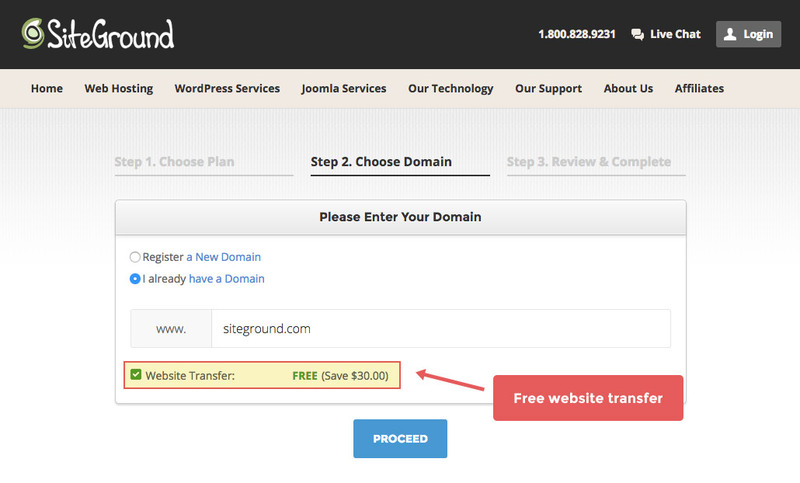 Disclaimer – I’ll earn a commission if you purchase your hosting from Siteground using the links in this article. Once you’ve completed registration with Siteground you’ll need to go through the process of installing WordPress. WordPress is a blogging software. It’s the software that I use for onecentatatime.com. The best part is that it’s SUPER easy to use and it’s also super easy to install on your website. BINGO. On the next page click the “Install” button in the “Do it yourself FREE” section. You can Also use the One Click install option Choose WordPress from the second screen Click Start to start installing Choose the domain name you install WordPress on to In the field next to the domain, you can enter a suborder such as ‘blog’ or leave it blank if you want the site’s main page to be the blog. Now, you need to read and accept terms & Conditions. And select Install now. The installation will take a couple of minutes at most, once done, Siteground will try to up-sell you with a bunch of stuff, don’t go for them unless you have reasons to. Once WordPress is installed, click on the “View Credentials” button to note WordPress admin link ( Mine is http://onecentatatime.com/wp-admin), Username, and Password. You can change these to something more memorable later, but you’ll need them for your first time logging in. Browse to your WordPress admin link to get a login screen like the one below. Enter your Username and Password. You are now logged into your blog. Well done! When you open your blog home link you will see a default Hello World post in your name. You can change the content of the post to welcome your first visitor. Once you did all this, do share us your experience and excitement. I’d like to be part of your joy. WordPress makes your blog ready for publishing content, it makes ranking higher in search engine result pages but, it doesn’t make your blog pretty. Themes are what makes your blog pretty and beautiful. Good news, themes can be plugged into WordPress with ease. Making your site pretty is an ongoing process. As long as you go on blogging you’ll make changes to the blog. Whether to add sidebar items or to change your page footers, logo, theme, etc. There’s no end of making your blog prettier. The first step is to pick a theme for the blog. The theme is a set of pre-designed elements that you can seamlessly take to your blog. A theme consists of a standard header, footer, font style, color combination a standard sidebar, etc. Fortunately, there are tons of free WordPress themes to pick from. I’d recommend you to use one of the free themes first, before moving to premium themes (that cost money) like Genesis that I’ve been using. The Standard Theme – This was the first theme that we used with One Cent at a Time. We loved it and still highly recommend it. The Genesis Framework – This is the current framework we’re using with One Cent at a Time. You’ll also want to look into the available StudioPress Themes. Hire design professional – Having experts design your professional looking blog is what you’d probably want to consider once you start making money from your blog. Consider this as your business investment. As I said before, 99 Design team is the one I had interacted with, and, can recommend to you for your need. Readers, if you face a problem while creating your blog, leave a comment below and I’ll help you out. Super! Was waiting for this article. Do you know if I can pay from my bank account, using routing and checking numbers? Yes thanks I paid with debit card and am all set. Care to give a good designer? i’ll mail you with the contact name and her rates. Enjoy blogging! It was smooth. We are up and running. Thanks a ton SB, you are the best!!!! Awesome!!! Great job Kathy you’d love blogging. Don’t want to share your blog name? I am in India, will they accept an Indian credit card? It’s a Visa card. Also, cna they accept one month of payment for hosting? Many thanks for the post. Absolutely, you should go for it. Visa is accepted everywhere. Also, as I said, if you want to make money you’ll have to spend it friend. This is called business investment. Try blogging for about an year. Then take your decision. Also don’t just blog to earn money, do it for as much fun as well. All the best! Nowadays starting blogs became very easy, lots of competition in hosting so we can get hosting at cheap prices, personally I recommend to go with BlueHost for first year, because of reliability and speed. I paid from Paypal and got the instructions in mail. Saw a few youTube videos I think this is not rocket science. The video was helpful. Setting up was really simple process. I helped my wife set up her food blog finally. Thank you man! That’s great Dojo, happy blogging! SB thank you once again for helping me out today and also for being my first blog reader 🙂 appreciate it a lot man! all the best! I launched mine on march 01 2011. Great post and I am sure this works. 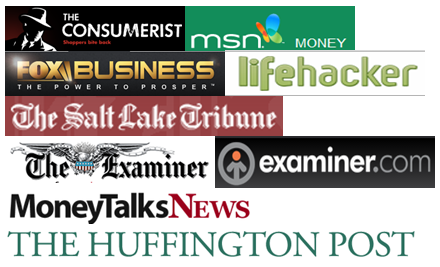 Do you know of any topics that are in high demand now? I write blogs for people on Fiverr.com and am one of the more in demand writers but getting burned out on writing thiem. I am assuming people who buy my blogs are basically putting them on a platform like what you are doing and generating recurring income. Any tips? It depends on how much time you spend on your blog. If you regularly post, share your post on social media and follow other blogs and comment on them regularly, you’ll get attention from advertisers. More you do the above, more money you can earn. HI! Thanks for nice information. did you buy the domain from Bluehost? Hi.. read the article and the associated comments. I believe, I have good English speaking and writing skills, lots of thoughts as well..but not getting the right move to start with. Request your support to guide me when and how to start with! Hi & thank you for your help ! I’m based in the UK and I wonder if I should use siteground or a UK based hosting company ? I’m in my 70th year and hoping to sustain life and a little luxury from continuing to work as much as I can. Blogging is very appealing and I hope I may succeed in interesting a good nucleus of subscribers. How do you get rankings on google? Do you pay for seo for your blog or does Siteground provide that? If anyone can answer this question, please leave detail. To answer in short, you’ll have to do your own SEO. Either you learn and implement yourself or you hire experts. If I were you, I wouldn’t have bothered about SEO for first 6 months. First priority is to write good content and write frequently. Sir, this was truly amazing and an eye-opener for people who keep thing on “Kuch alag karte hain (let’s do something different apart from the primary job)”..
Sir, I have started my new website wwe.ekseek.com (bcoz to start is important) and need your help to flourish. In this website I provide daily updated discount coupon codes. I would be really thankful if you can guide me !! 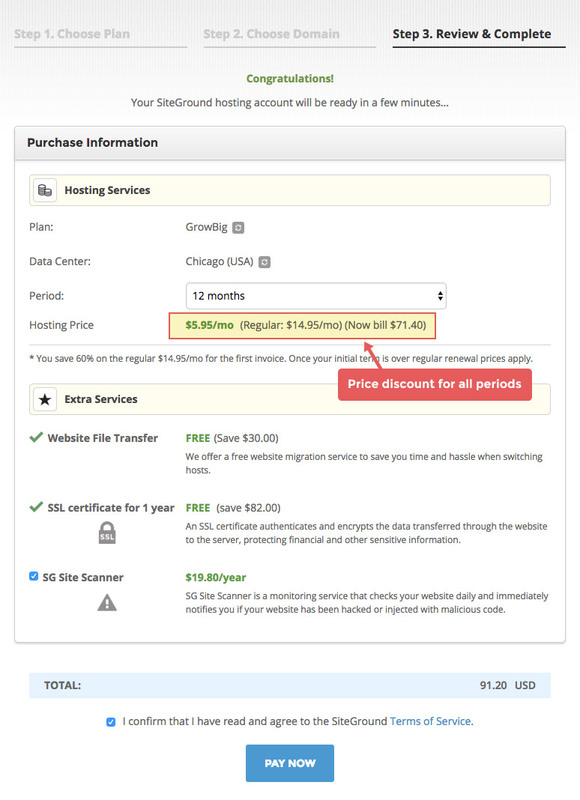 i checked out siteground Hosting…and they want payment up front for three years for the starter package..way more than ‘20.00 to get started…am I reading this wrong? thank you in advance..
You opt for $106 for 36 months @ $2.95 per month. Uncheck all add-on services. You’ll get the domain free with 36 months subscription. Now if you are satisfied, you can keep it. Else you can cancel your hosting. When you do so, you’ll be charged prorated monthly fee and domain registration fee of $15. If you cancel within the first month you’ll pay only $15+$2.95. Which is what I mentioned as less than $20. You’ll get rest of your money back once you have cancelled. Go ahead, create your blog. Let me know if you need help in setting up. I love blogging on WordPress and thank you for these smart tips you shared! Just got much new ideas. I think this tutorial has helped a lot of people to get started with their WordPress website. Very detailed and informative article. I love, when bloggers take the time and make screenshots of the different steps. Good job! I think this is one of the most significant information for me. And I’m glad I came across your article. Thank you for sharing your opinion! This is one of the easiest guide I have read lately on how to start a self hosted blog. Not only the language is simple but you have also suggested a good web hosting i.e SiteGround which is one of my favorite.